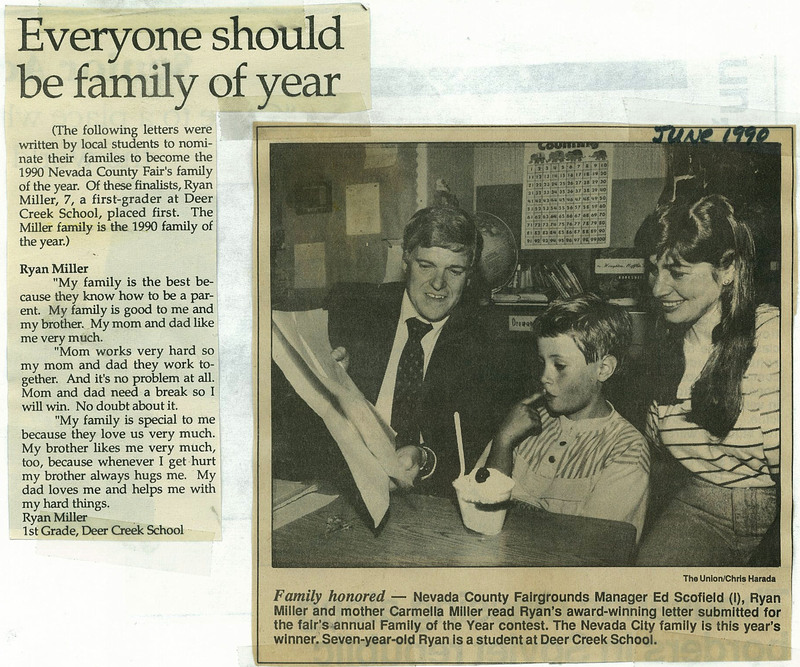 In the spring of the second grade, Ryan did something truly amazing. He wrote four sentences to win a contest. Every year our Nevada County Fair had an essay contest for the elementary kids. The topic: Tell why your family should be “Family of the Year.” The prize: a complete FREE week at the County fair for the aforementioned wonderful family. I received a call at work one day from the secretary of Ryan’s school. My breath stuck in my throat as I prayed he had not thrown another rock and hit some kid in the forehead with it…(he had done this on the second day of kindergarten)….but alas, she told me of the winning essay. I was teaching English. An essay by OUR Ryan? Did his giftedness have no bounds? An essay? And so the four sentences were published in the newspaper. I love my mom because she works hard. My dad helps me with the hard things. I love my brother Mark because he hugs me when I get hurt. He is the best brother in the world. We received our VIP name tags on fancy lanyards and an invitation to a VIP ceremony where everyone could meet the “Family of the Year.” We were thrilled that Ryan could be in the spotlight for a change. Children with special needs siblings are often lost in the focus needed for their siblings. Here was our chance to dote on our son Ryan. The second we heard about the VIP ceremony, we lived in misery. At four, Mark was newly walking and still doing the jib skid as needed. He was social, curious, impulsive, and impatient, toileting was incomplete, and he hated being held anymore. Holding him was against his sense of independence and right to freedom. Whosoever impinged on his rights would have to pay the price! Yet, we could hardly be Family of the Year if we left Mark home! On the day of the ceremony we spit shined ourselves, packed a bag of amusements for Mark and showed up 15 minutes late on purpose. It would be less time for us and everybody else to have to cope with Mark should he throw a tantrum. Walking to the stage through the bustling fair events revved Mark into a storm of excitement. We tried to keep him calm; we could not put him down for fear of losing him in the crowd, or getting filthy. We had a stroller, but he wiggled out as soon as we buckled him in. (Some skills were evolving too fast). We lived in fear that Mark might have a poop disaster at the ceremony. It was over 95 degrees and sweat ran off our faces and soaked our nice clothes. Ryan never complained. No matter how stressed Steve and I were, we tried to keep up the joyful mood in spite of the fact we were nearly in tears. Once on the stage, we were put behind a curtain and asked to wait for the fair chairman to announce us. A photographer waited to snap our picture as were received our certificate. It was hotter behind the curtain that outside, and Mark could hear the crown on the other side of it. I felt frustrated to want to embrace Ryan and show him how proud I was, but Mark monopolized my attention without mercy. Steve and I passed Mark back and forth for 20 long minutes more. Then, we knew the worst had happened. Despair should be a term in a book and never felt in real life, let alone in public! Our hair was a mess, our clothes wet and wrinkled, and we smelled crap! Mark had made a giant crap in his pants at the exact moment the announcer finally called us up to the front. We had used up the big baggie of wipes trying to keep all of us clean and cool, and had no water to clean him up. Poor Steve was trying to hold onto him but lost the battle. Mark slid to the floor and jib skidded past the curtain and a few times around the stage while the audience took a few steps back from his poopy smell. He blessed the crowd with yelps of delight, fan fare waving, and celebratory hoots. Steve, Ryan, and I stood holding hands, our smiles frozen in spite of the heat. Ryan read his “essay” to the crowd, and the photographer gave us a minute to smooth ourselves out, but we hadn’t had a chance to change Mark’s pants yet…. but the photographer was behind schedule too. 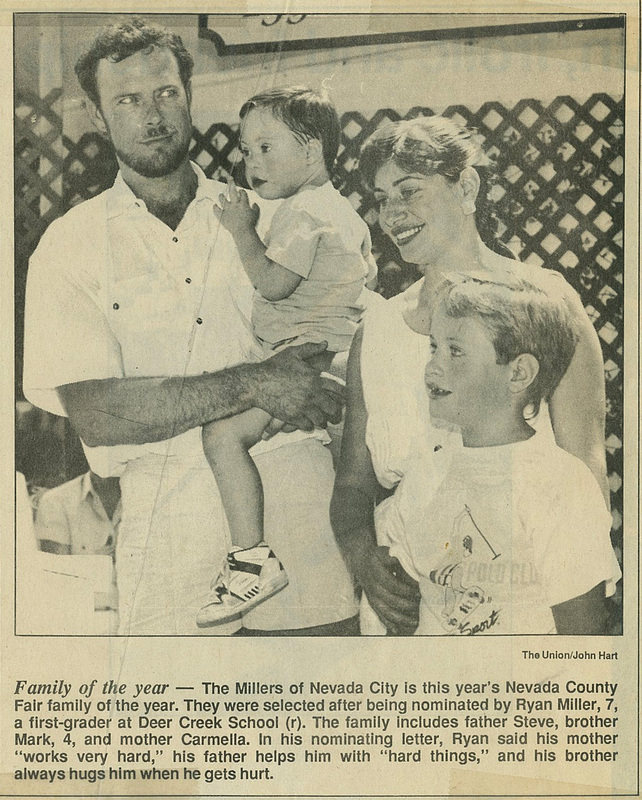 So, we embraced and smiled for the camera as the 1990 FAMILY OF THE YEAR! I realized at that moment, that Ryan deserved this free week at the fair more than any of us could have dreamed, and Mark was the kid with the best brother in the world! Now, look at Steve’s expression in our newspaper picture! This entry was posted in Down Syndrome Help, Education, Out In the Town, Raising Down syndrome Boy and tagged Carmella Miller, Down Syndrome Help, Down Syndrome in Public, Down Syndrome Nevada City, Down syndrome sibling issues, Down syndrome stories, Ryan Miller. Bookmark the permalink.